Human perception of the intensity of sensation is more or less logarithmic. If we double brightness or loudness, we have to double it again to get the same sense of change of intensity. Pots used for controlling quantities that we perceive are therefore made to match this logarithmic characteristic, and have a resistance taper constructed so that their transfer function with respect to rotation is exponential (even though they're referred to as 'log pots'). But the overwhelming majority of the pots sold are approximations - generally two- or three-segment piecewise linear approximations. 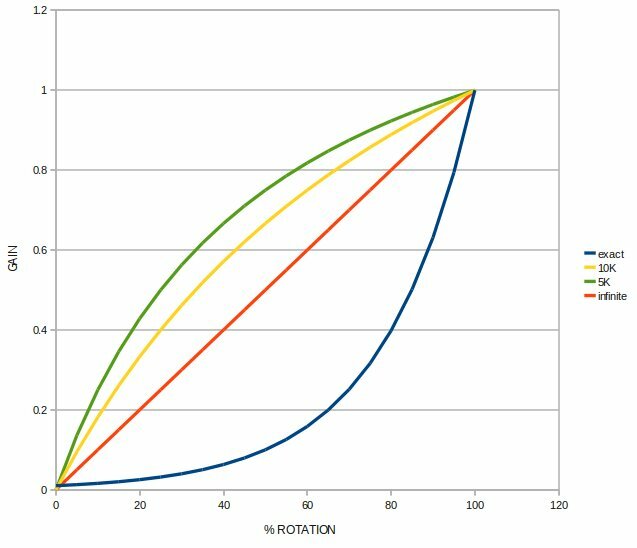 And of course, zero rotation will always correspond to zero output, even though that can't happen with an ideally exponential transfer function. It's possible to get an approximation of log taper by shunting the wiper to the bottom leg of a linear pot with a resistor of roughly one-tenth the value of the pot. This is useful if a particular model of pot is only easily available in a linear taper, or with digital pots, which are generally 2n taps of the same resistance value. It's also useful if a reverse taper is what's needed. 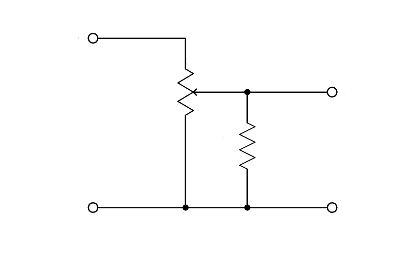 The ratio of resistor to pot value can be adjusted to give the best fit to the desired characteristic along the segment of the transfer curve where accuracy is most important. A possible disadvantage of this method, though, is that the pot no longer presents a constant load to what's driving it. 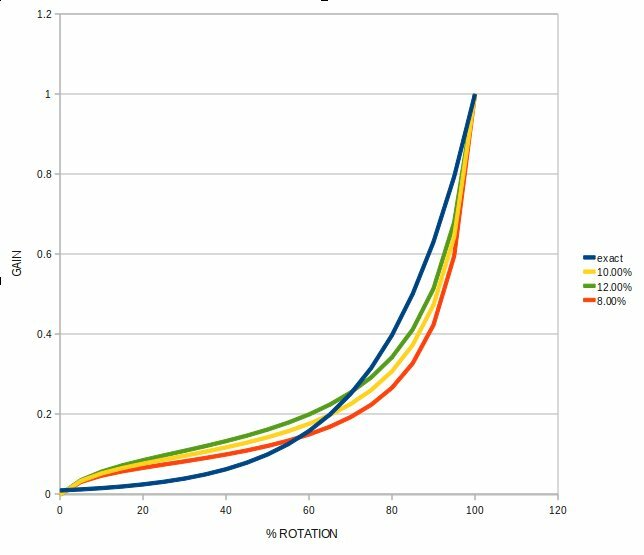 The plot above shows an ideally exponential transfer function (blue) , with the gain set to reach 10% of full value at 50% rotation, which is typical for audio pots. 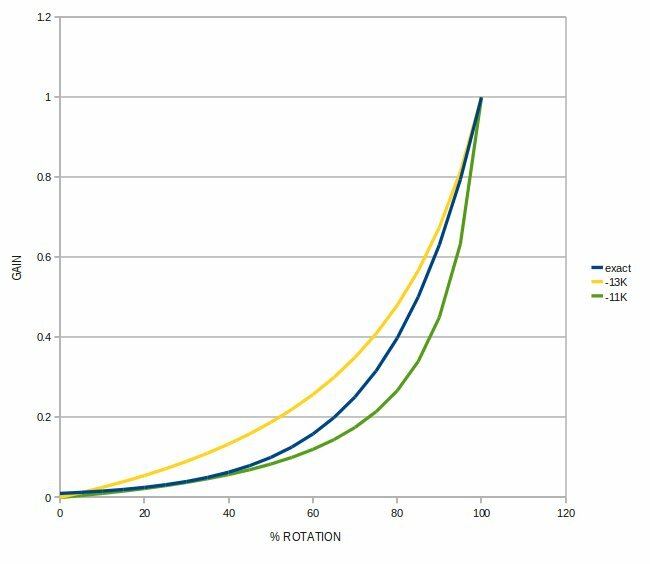 The other three curves represent the transfer functions of a linear pot shunted by 8%, 10%, and 12% of their total resistance. The plot shows various values of R paired with a 10K pot. 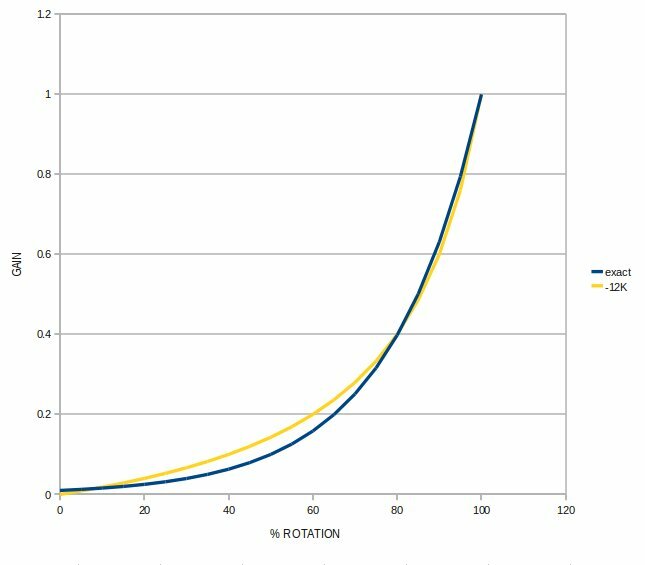 Which is pretty much what we're looking for - a reasonable approximation of exponential that can be adjusted around the ideal curve. 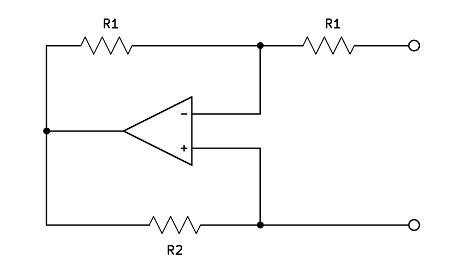 A voltage V applied to the lower terminal (relative to the upper terminal) will be met by an opposing current coming from R2. The current is -V/R2, so the apparent resistance is -R2. 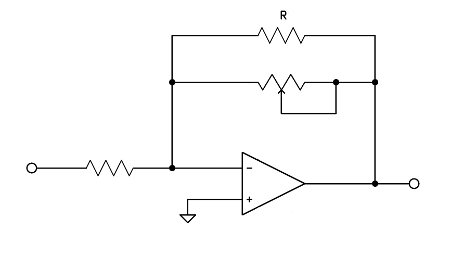 The value of R1 doesn't matter, as long as both resistors are the same. RI here just sets the gain for the whole stage. 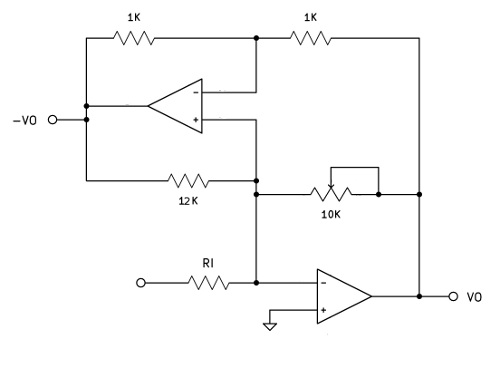 Note that the input impedance of this circuit stays constant as gain is changed. Also note that the inverse of VO is now available, useful if this stage needs to drive a balanced load, like the input to an audio A/D converter.